Ironically, those words were written by the same woman whose best-selling and critically praised book published in 1955, “Gift from the Sea, “was inspired by her secret getaways to Captiva Island off the Lee County coast with her husband, famous aviator Charles Lindbergh. But the author, philanthropist and avid shell collector was on to something when she described the beaches a place to clear the mind and relax–advice that serves the studious, always busy young population of Florida Gulf Coast University well. Either go to the on-campus waterfront or drive west about 20 minutes, and textbooks, lectures, midterms, research papers and finals are sometimes miles away literally, and worlds away figuratively, as students gather a few of their favorite things and soak up the sun, sand, surf and, most of all, sense of togetherness with friends. A few even bring along their FGCU-inspired love of the environment. Heather Kobrzynski, a junior environmental engineering major from Chalfont, Pa., tosses her paddleboard atop the Jeep of close friend and 2018 English literature grad Zoe Skrivan of Naples and spends Saturdays getting “in touch with the environment. ”We also try to bring out a trash bag, knives and scissors so we can collect trash and fishing line tangled in the trees,” Kobrzynski said. Andrea Prytulak has a special beach hat (4) that was “gifted to me by a good friend on the day of my surprise birthday party at the beach. 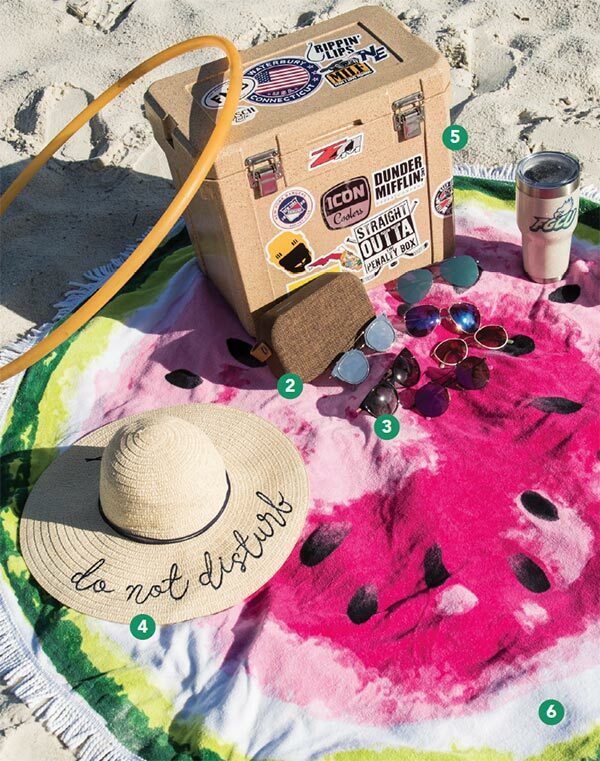 “I love that the hat is embroidered with ‘do not disturb’ because it makes it fun and unique … the perfect summer hat to feature in vacation photos,” said the senior integrated studies major from Venice Beach. Another must-have at the beach is a cooler (5), and Vincent Pace, a senior accounting major from Waterbury, Conn., makes sure his looks as cool as the drinks and snacks it keeps that way. “My cooler is special to me because I’ve been able to collect stickers over time that showcase my different hobbies and the different places I’ve lived,” Pace said. 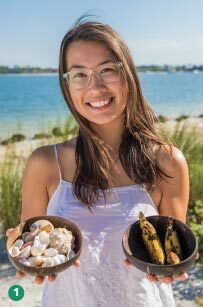 So just as Anne Morrow Lindbergh wrote that shells were her “island eyes, “these students have created and coveted their own personal reminders of salty but-sweet times along the shore.